...if mental disorders are brain circuit disorders, then successful treatments need to tune circuits with precision. Chemicals may be less precise than electrical or cognitive interventions that target specific circuits. One of the first to champion this position was Dr. Helen Mayberg and her colleagues, who conducted a small trial using deep brain stimulation (DBS) as a treatment for intractable depression (Mayberg et al., 2005). The technique has been heralded as a potential breakthrough in psychiatry, with $70 million in BRAIN Initiative funding going to DBS development. So a recent tweet announcing the failure of a major clinical trial garnered a lot of attention. The news that St. Jude Medical failed a futility analysis of its BROADEN trial of DBS for treatment of depression cast a pall over an otherwise upbeat attendance at the 2013 NANS meeting. Once again, the industry is left to pick up the pieces as a promising new technology gets set back by what could be many years. It’s too early to assess blame for this failure. It’s tempting to wonder if St. Jude management was too eager to commence this trial, since that has been a culprit in other trial failures. But there’s clearly more involved here, not least the complexity of specifying the precise brain circuits involved with major depression. Indeed, Helen Mayberg’s own thinking on DBS targeting has evolved over the years since the seminal paper she and colleague Andres Lozano published in Neuron in 2005, which implicated Cg25 as a lucrative target for depression. Mayberg now believes that neuronal tracts emanating from Cg25 toward medial frontal areas may be more relevant. Research that she, Cameron McIntyre, and others are conducting on probabilistic tractography to identify the patient-specific brain regions most relevant to the particular form of depression the patient is suffering from will likely prove to be very fruitful in the years ahead. But it was hard to find any other information about the failed trial. I can't be sure, but I think this is the study in ClinicalTrials.gov – A Clinical Evaluation of Subcallosal Cingulate Gyrus Deep Brain Stimulation for Treatment-Resistant Depression. The sponsor is St. Jude Medical. The record hasn't been updated since March 2013. BROADEN is a tortured acronym for BROdmann Area 25 DEep brain Neuromodulation. The July 30, 2013 version of the BROADEN website is preserved at archive.org. 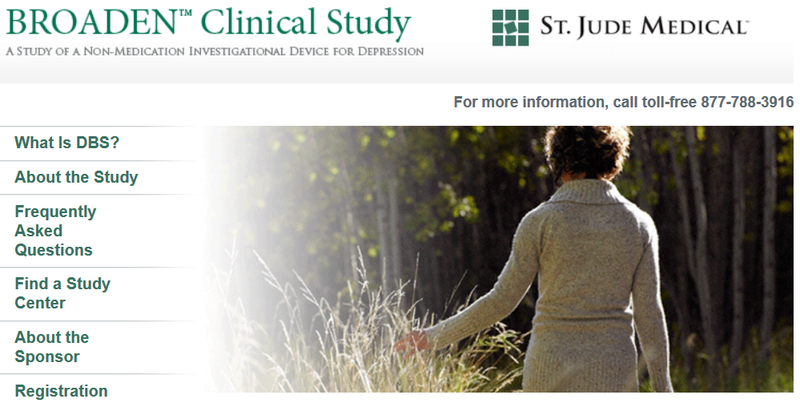 The BROADEN (BROdmann Area 25 DEep brain Neuromodulation) study is a study to evaluate the safety and effectiveness of deep brain stimulation in patients with a severe form of depression known as Major Depressive Disorder (MDD) who have not responded to multiple treatments. Stimulation to the brain is provided by a surgically implanted medical device called a deep brain stimulation (DBS) system. The system provides stimulation directly to an area of the brain known as Brodmann Area 25 (sometimes referred to as BA25). The study will build upon the depression work of a research team from the University of Toronto, led by neurologist Helen S. Mayberg, M.D. and neurosurgeon Andres Lozano, M.D., PhD, FRCSC. Regarding the Broaden Study, I'm not writing it off entirely but things aren't looking good. The FDA has put the brakes on the study so it will not enroll any new participants. While the study is over a year old, the results so far are not encouraging and the device manufacturer is scaling back on monitoring and programming. It appears that a possible major misstep was made, by not including fMRI mapping prior to implanting the electrodes. As Neurotech Business Report (NBR) mentioned, more precise mapping of the white matter connections of the subgenual cingulate (Brodmann area 25) may be essential (e.g., Johansen-Berg et al., 2008). To determine the anatomical connectivity of the subgenual cingulate region, those authors performed tractography (using diffusion-weighted magnetic resonance imaging) to trace the pathways mediating treatment response with DBS. They compared the connections of the subgenual ACC (sACC, blue/cyan) and the perigenual ACC (pACC, red/yellow). Fig. 3 (Johansen-Berg et al., 2008). Connectivity-based parcellation of anterior cingulate cortex (ACC) and location of electrode contacts. Effective electrode locations are mainly localized within the sACC subregion. A July 11, 2011 News Release from St. Jude Medical announced that the FDA had approved an expansion of the BROADEN Trial so that up to 20 different sites could enroll a total of 125 patients. There were only three sites originally – Chicago, New York City and Dallas. Perhaps the trial resources were getting stretched too thin. Unfortunately, much of the progress in our understanding of DBS mechanisms in depression is potentially wasted without a vibrant installed base of patients and clinicians using and perfecting DBS therapies. ... In our view, the FDA needs to understand the vital importance of getting first-generation devices into the field and move away from arbitrary standards like improving symptoms by 50 percent in 50 percent of the population. The notion that if we can’t help everybody we shouldn’t help anybody has no place in medical science, particularly when you consider that neuromodulation therapies are working with the hardest-case patients who have not responded to other therapies. If anyone has additional information, please leave a comment. 1 This blog [EDIT: i.e., the DBS Trial blog] is written by another individual [not me] who for the past four years has had an implanted device for the treatment of intractible depression. Johansen-Berg H, Gutman DA, Behrens TE, Matthews PM, Rushworth MF, Katz E, Lozano AM, Mayberg HS. (2008). Anatomical connectivity of the subgenual cingulate region targeted with deep brain stimulation for treatment-resistant depression. Cereb Cortex. 18:1374-83. Mayberg HS, Lozano AM, Voon V, McNeely HE, Seminowicz D, Hamani C, Schwalb JM, Kennedy SH. (2005). Deep brain stimulation for treatment-resistant depression. Neuron 45:651-60. Disappointing. I watched Dallas Buyers Club recently about the early stages of the HIV crisis and the development of HIV drugs (from the point of view of the patient, mostly). I'm wondering if something similar will happen in the DBS field, with some people starting to hack their own DBS systems to try things out by themselves, and in the process make faster progress. Psychiatrists can't even agree on what "major depression" is (and isn't. So this is not surprising. Neurocritic, after reading Footnote 1 I was wondering if, anecdotally, the DBS treatment seems to be working for you. Anything you would like to share? Any side effects? Any changes in effectiveness over the 4 years? Thanks. Oh, I was referring to the DBS Trial blog... The writer there says, "I have been implanted with an EXPERIMENTAL electronic stimulation device - in my BRAIN - to reduce my depression. I've crossed the four year mark." As part of the Broaden Study, I can state that the side effects caused by the device were, at times, worse than the depression itself. Those that conducted this study and anyone else who has jumped on the DBS bandwagon would do well to take a good hard look at those left in the wake of this failed study. I'm so curious to know more about this study and anything to do with the brain and its relation to all forms of mental illness. I was always skeptical about narrowing down something as complex as a mental illness to one "hotspot" in the brain but I recall the Lozano presentation on DBS for depression and the research indicated several areas had noticeably decreased activity while cg25 had high activity, so I followed along. I also recall a statement made by Mayberg herself, a couple actually; "for all we knew, we could turn on the contacts and make things worse" which pertains to your comment a great degree. She also noted that for those it doesn't work for, that, "they perhaps aren't the right patient" and that "we would have to understand the biology better". Which again is why I say I'm ever skeptical of narrowing it down to one thing, or place in the brain or structure. But I can't help but pervay upon the empirical facts we do have and think that perhaps we need do need to change how we rate and consider treatments as is stated in the Red lettered text. I should also state that I'm not so much a neuroskeptic rather, I'm near entirely neurocentric. I didn't come here to change minds or to upset but as the nature of good debate goes, to better approximate the truth. As my opinion stands I believe wonderful answers can be found within the brain but we must know more understand better. In the journey of 100 miles we've went about three inches and even those three inches have come from horrible mistakes. I assume most people here have heard of a patient by the name of H.M. who had his entire Hippocampus removed and could no longer translate recent events and information into lasting memory but his motor function memory was intact. Or consider Alzheimer's disease, a disease where one not only forgets but cannot comprehend the very nature of food, the concept of eating, where they are in time and space and we know that that is without a doubt do to neural malfunction and degeneration. Alzheimer's patients often suffer from depression and personality changes, aggression and isolation. So I believe the answers are primarily between our ears and that we shouldn't give up on the most complex thing in the entire universe. I AM PART OF THIS STUDY AND THIS DEVICE HAS NEVER WORKED FOR ME. I HAD FOUR GRAND MAL SEIZURES AFTER MY SURGERY, AND SPENT FOUR DAYS IN THE ICU THAT I DON'T REMEMBER. IT TOOK ME TWO DAYS JUST TO WAKE UP. I AM SORRY THAT I EVER GOT INVOLVED WITH THIS STUDY. Anonymous of April 18, 2014 - I'm sorry that you and the earlier Anonymous of February 05, 2014 had such a terrible time. Your experience in particular sounds like medical malpractice. I agree with you in thinking this may be medical malpractice. I had to go home with my sister and she took care of me for 17 days because I couldn't function. When she found a good rehab facility, they wouldn't let me go. So I had no Rehab. I couldn't walk or talk right. I couldn't use my debit card or cell phone and I was still hallucinating. I am thinking of having a free consultation with an attorney. I have been thinking that this may be medical malpractice for a while. I had to go home with my sister and she took care of me for 17 days. I couldn't walk or talk right. I couldn't use my cell phone or debit card, and i was still hallucinating. They said they would help with rehab, but when my sister found a facility for me to go to, they denied it. I am thinking of getting a free consultation with an attorney. I have had DBS for OCD and they used an MRI to place the electrodes accurately. This is absolutely standard in DBS treatment. Defining Critical White Matter Pathways Mediating Successful Subcallosal Cingulate Deep Brain Stimulation for Treatment-Resistant Depression, published in Biological Psychiatry. "Results: Whole brain activation volume tractography (AVT) demonstrated that all DBS responders at six months (n=6) and 2 years (n=12) shared bilateral pathways from their activation volumes to (1) medial frontal cortex via forceps minor and uncinate fasciculus, (2) rostral and dorsal cingulate cortex via the cingulum bundle, and (3) subcortical nuclei. Non-responders did not consistently show these connections. Specific anatomical coordinates of the active contacts did not discriminate responders from non-responders." Anonymous of May 01, 2014 11:09 AM - I believe that is the case, or at least this sort of probabilistic tractography was not done. I am part of the study. It DID work for me and MRI mapping was done prior and following my DBS surgery. The abject misery of severe, treatment resistant depression necessitates the need for vigorous, ongoing research in this area. Depression is a DEADLY disease and should be treated just as seriously as any other "physical" malady. Yes, there area always risks associated with groundbreaking medical treatments, but the rewards for those of us who suffer (as well as our loved ones) are immeasurable. Would we have the same objections to those who pioneer experimental treatments for cancer? mcan - I'm happy to hear that the treatment worked for you. Thanks for letting us know. I wish you continued good health. Clearly the accuracy of electrode placement is key and the way in which this is achieved for Parkinson's disease is to do the electrode implantation by real-time MRI. With an MRI-compatible neuro-navigation device, the accuracy of placement is within 1 mm. I would never do an electrode placement any other way, and perhaps the variability in outcome is more attributable to outmoded placement technology than anything else. My wife is a participant of the Emory-Mayberg trial, implanted in 2011 (fMRI for analysis, MRI used for placement). For us, this has been a life changing event. After many years of frequent medicine changes, ECT, phsychotherapy, etc., all of which worked only briefly, my wife was at a point where her brain was non-functional: Speech was difficult, driving was impossible, relationships were unimportant, my wife was just a shell of the incredible person she once was. Then the implantation and the slow but steady return to life. After three years with DBS, the improvements continue, getting better with each passing month. I am not sure whether the connections in the brain continue to improve or whether my wife is able to work on the physchological issues now that the biological issues are greatly improved. Either way, my wife has her life back and she is immeasurably grateful for this technology and the trial at Emory. Wishes: A rechargeable IPG. Currently, batteries last about 11 months and require (minor) surgery to replace. A side note: I have always found it amazing that the public assumes that the brain is the only perfect organ. Other organs can be defective, but not the brain. Everyone agrees that Diabetes and Cystic Fibrosis have a biological cause, but it is controversial to say "mental illness" has a biological cause. The Emory DBS trial proves to me that there is indeed a significant biological component to depression. Thanks for reporting on your wife's condition. I'm glad to hear that DBS has been so successful for her. I wish her continued good health. I am part of the Broaden Study and am in the 4 year follow up phase. I go in for a 6 month check in a few weeks. I'm definitely going to try to get more information about the study and what happens if they abandon this part or when it is over. The paperwork said they would turn it off or take it out at the end of the 4 year study. But in my opinion it has helped me. Yes, I have been hospitalized several times after the procedure but I am functioning much better than I was prior to the study. The objective measures may not show it but I know it has helped even just the slightest. I'll take that. But I'm worried about the "what next." Have you heard of any updates since earlier this year? I was one of the first people to have this treatment in Chicago maybe 6 or 7 years ago. Here's the scoop. We think that only people with depression does it help. Nothing else. No personality disorders, no eating disorders, no bipolar, no medical conditions or drugs which cause depression. Further, the other sites did not require bilateral ECT as a requirement. This site did. The people who had that would have already been pre-screened to have had severe depression. In the other sites, we think the candidates were so desperate they answered questions to get into the study. So bipolar would become straight depression. Seasonal affective, straight depression. You get the idea. So this treatment only works with one type of depression and one type alone. For side effects, I have had none. It has continued to work for me. The quality of neurosurgeon determines this one IMO. A few millimeters off and you have misery with no benefits. PS. I am out of the 4 year windows in 2011 and they will keep it going for as long as you wish. Don't worry about that. You just don't have to go in for testing. Thanks for sharing your positive experience with DBS. I'm so glad it worked for you. It's also good to know about the more restrictive inclusion criteria that may not have been enforced elsewhere. my wife had this surgery as part of the St Judes trial and it was the worst decision out. No follow up, lack of understanding and in my mind, incompetence. She now has major cognitive issues and memory loss which has been proven to be a result of excessive stimulation. Any adjustments to the device stimulation settings need to be carried out strictly in a controlled environment where someone can be monitored over a period of a day or two to guage any conflict, not in a half hour session with a clinical nurse who doesnt have the experience specific to depression. Other problems are that because it was a clinical trial, any ability to get open communication from the study are cloaked in darkness. Companies need to remember they are dealing with real people with families. Your experimental brain surgery needs to be radically slowed down rather then rushing in to try to capitalise in on a multi billion dollar industry. I'm sorry your wife had such a negative experience. Seems there's such a huge degree of variability at the different sites, and of course in how individual people respond to treatment. I think I lucked out with the surgeon. He does his surgery differently than everyone else. Uses sound of neurons in the brain to navigate. No other surgeon does that. Different regions of the brain make different characteristic sounds. As for keeping it after the study has been cancelled, I'd say that is slim to none. I misspoke earlier. From everything I understand, according to US law, a patient CANNOT continue receiving treatment for a non-approved therapy. This happened with Vagal Nerve Stimulators. Patients had theirs removed. So all people in the study would have the units partially or wholly removed and go back to previous treatments. It is still property of ANS. You can apply for Compassionate Care and slim chance keep it going but then would need to fund the surgery and equipment out of pocket. I doubt anyone would have the spare 120k lying around each year for that. As for the future, I question that any company will spend the 70 million again on already failed FDA treatment. First off, patients were told you could get better, worse, stay the same, or you could die. It's brain surgery. It's not a treatment, it's an experiment. Nobody should have signed up without expecting possible severe side effects. This is a last ditch treatment for patients who have failed ECT, failed drugs, failed everything and were likely to stop eating, starve, or attempt suicide. ECT causes severe memory loss and cognitive side effects by the way. Second, the information that it failed FDA approval or halted by the FDA is prima facie a blatant lie and demonstratively false. St Jude, the company, withdrew the trial. They are working to identify better patient criteria selection to ensure people who go through this treatment are likely to reap benefits. This is not a one size fits all treatment. Post partum depression, bipolar, even one manic episode, and you would want to wait and enroll in a study that fits your diagnosis. There will be deep brain studies for bipolar patients and others. It's like there are different strains of the flu. Third, any current study participant will continue to get treatment even after they are finished with the study. St jude will continue to donate the Libra devices for battery replacement. Forth, regarding adverse effects. People with high blood pressure, smokers, drug users, anatomical or structural abnormalities should think carefully and weigh their options before rushing in to this treatment. It is major surgery and you are statistically likely to encounter more problems. You might be a poor candidate for such an invasive procedure. Last, understand this is a temporary mechanical stop gap to relieve symptoms, a salvage operation to rescue treatment resistant, endogenous unipolar depression patients otherwise doomed to a life of misery, until something better comes along, such as gene therapy. Anonymous of January 30, 2015 11:01 AM - The reason there may be so much "misinformation" floating around is that the sponsors of the trial haven't released any information to the public. And even some of the patients might not be fully informed. This raises all sorts of ethical issues. I have not found any info anywhere that explains why the BROADEN trial was halted, other than in the Neurotech Business Report, which said the news was delivered at the 2013 NANS meeting. Only experts and professionals in the field of neuromodulation would attend that meeting. The original BROADEN trial website http://www.broadenstudy.com/ has vanished into thin air. But you can still find remnants at archive.org. For example, this page lists three centers and the participating psychiatrists in Chicago, Dallas, and New York. Here we have the clinical study overview, FAQ and brief version of the inclusion criteria. But SMJ has only this to say about the BROADEN trial: "This study has been closed and is no longer enrolling participants." And I couldn't find anything on ClinicalTrials.gov either. So if you know of a source of public information, please let us know. Here is the correct archive link for the BROADEN clinical study centers (and participating psychiatrists) in Chicago, Dallas, and New York. Hi, has anyone tried "cranial electrical stimulation"? It is easier to administer, can be done at home, and is noninvasive. Lot of information on the Internet about it so Google it. I haven't taken the time to update my personal blog, partially due to the changes in the study and other personal reasons. But I will soon. From what I have inferred about the "failure" is that some specific sites (like the original 3) would pass the FDA criteria but as it was rolled out, the successes diminished. My personal opinion, with no data to back it up, is there was a combination of things that occurred, many of them already mentioned. The 'perfect' candidates for the study may not have been screened as effectively at the new sites. The placement of the nodes may not have been as precise. And the biological fact that my brain is not your brain because no 2 brains are identical, played a large role. What 'they' have learned is enormous. I truly have empathy for those in the study who had adverse side effects. Possibly more could have been done to avoid those. One person with whom I have some contact with, that had severe problems, agrees that the technology has promise and doesn't want the research to cease, but wants more evidence based controls in place. From reading/listening/studying Dr. Mayberg and others' research, it is very apparent the technological advancement DURING the study was exponential. Fine tuning the ability to actually "map" an individual's depression is right around the corner. Without the successes and failures of the studies, this would not have been possible. Are there ethical concerns? Yes. And there were when the first HIV medicines came out... and first heart transplants... and and and. Again my guess, not fact, is that the research will divide the disease 'depression' into a number of similar diseases, each with it's separate "best" treatment options. As for the future of those in the St. Jude study, the paperwork has already been approved (through FDA humanitarian exemption) for some of us who wish to keep the units and will be replaced with the smaller, rechargeable Brio device. (I say some, not all, because I can only speak for myself and the few I have contact with). (There is a closed FB page some of us gather on). I do believe some of the protocols should have been more stringent to avoid further hurting those with bad side effects. But I also believe 'they' continue to gather data on those not out of the four year study and the results will change depression treatments and deep brain stimulation, for the good. **I have to laugh - in order to post this comment, one must do something to keep spammers out and also, in their words "prove you're not a robot". Nope, not one yet, anyway. I had the St.Jude implant 1/7/2013. I seem to be improving VERY slowly month by month.I hope to actually try working a little soon. I Recently had the 1st. battery replaced. No side effects, except for the "tether" wire from new battery being a little too short and causing some mild discomfort in my neck at times. I continue to have memory problems- perhaps due to bipolar ECT? and often experience "mental paralysis" when I try to do office work or think of calling people. I'm SLOWLY getting better at that - this comment is a positive step. Thanks to all of the great people that have taken the time to put out the info!! I have read the blogs from time to time and it has helped me.I felt bad that I couldn't contribute. I hope that they continue to perfect this treatment. I had my surgery in Chicago on March 12, 2009. I went through a rigorous screening process, had an amazing surgeon, very thorough follow up appointments, and to call the results a miracle for me would not be an exaggeration. I tried just about every medication out there, countless hours of therapy, hospitalizations, and many series of shock treatments which did little more than erase years of memories. I have had no real side effects and feel incredibly blessed to have a life now. I feel really bad reading of the people who have had such different experiences than I have. I am so sorry. I feel like I have a second chance at life and am very very grateful to Dr. Mayberg and the amazing team I worked with at Alexian Brothers. "Second, the information that it failed FDA approval or halted by the FDA is prima facie a blatant lie and demonstratively false. St Jude, the company, withdrew the trial." Much of this confusion could be cleared up if the study sponsors practiced more transparency. Medtronic hasn't fared any better. Like the BROADEN study, Medtronics' VC DBS study was discontinued owing to inefficacy based on futility Analysis. If the FDA allowed St. Jude to save face with its shareholders and withdraw the trial rather than have the FDA take official action, that's asserting semantics over substance. I'll be participating in a DBS trial for depression if all goes well. After substantial reading of academic articles the risks are rare and limited but the benefits could be astounding. Looking forward to the experience! The BROADEN study isn't continuing the 4 year follow-up study. I'm in it and just got a phone call. They'll put in a rechargeable device for those of us enrolled and will not follow up with us. The FDA approved it just for us who had the surgery. It looks like St. Judes isn't going foe FDA approval anymore. I have no public reference for this but it was what I was just told over the phone. It has helped me and I don't know what I'm going to do about follow-up care except with my psychiatrist who doesn't have DBS experience. Scary. I'm terribly sorry to hear it, that is scary. I hope you can find a physician who has experience with DBS patients. Good luck. Just for kicks, let's consider a hypothetical. Imagine that DBS for severe treatment-resistant depression shows promising results in some open-label (very important) trials with small numbers of patients. From those open-label studies, a couple device manufacturers decide to conduct fairly large scale double-blind (very important difference), placebo-controlled (another very important difference) trials. There is good reason why double-blind, placebo-controlled clinical trials with significant patient populations are required to demonstrate efficacy. Small patient populations and open-label studies are subject to influences that can make treatments appear effective when, in fact, the effectiveness cannot be replicated in double-blind studies with careful placebo controls. Patients who experience success in open-label studies often praise their doctors and medical team. This should raise concerns that placebo or other peripheral effects are at play. Let's imagine that at some point during these large scale, double-blind, placebo-controlled clinical trials, the FDA performs its standard futility analysis in order to determine if the studies are likely to be successful at demonstrating statistically significant efficacy and safety. If so, the devices are likely to be approved for proceeding to market. Now lets imagine that the FDA conducts its futility analysis and the results are not good. Neither large scale double-blind clinical trial will be able to demonstrate efficacy. The device manufacturers (aka study sponsors) are informed of this bad news. (B) quickly halt the clinical trial in question and have its PR department work on "spinning" the action so as not to sound negative? I find it rather troubling that the FDA goes along with these shenanigans. On a related subject, there's an interesting article in the June issue of Science magazine, entitled "Brain implant trials raise ethical concerns" by E. Underwood. It's worth a read. I would have emailed a copy to The Neurocritic but couldn't find a link to do so. Please contact me if you're interested. Thanks. With all due respect to your understanding I’ll opine you are incorrect. As a very, very, very long-time mental health advocate/activist and support person to my spouse who is implanted with VNS prosthesis for more than 15 years there are facts to be understood. No one can be forced to remove their prosthesis unless adjudicated by law. In the case of VNS which is the first neuro-modulation device FDA approved for depression it was also the first medical device to be denied by CMS (Centers for Medicare and Medicaid Services). FDA approval does not guarantee health insurance coverage. I have been battling with HHS (Health and Human Services) and CMS for more than two (2) years for not grandfathering care for the study subjects and patients who benefited from the therapy and which to continue. In roads are slowing being accomplished. The sponsor of the therapy, Cyberonics, reneged on their written guarantee to care for the study subjects. I would suggest carefully reading any documents signed by any study subjects especially as it relates to one’s medical coverage and care. Check carefully to see if the sponsor of the study is obligated to care for the study subjects at least and until FDA approval. Without going into elaborate detail be aware that CMS and the medical profession acknowledge the doctrine of “Continuity of Care” should you need health insurance coverage or need legal assistance to obtain medical coverage and care. Also understand that private health insurance carriers are not governed by Medicare/Medicaid. I wish you all wellness and all the good you’d wish for yourselves. the Food and Drugs Administration after failing a futility analysis that indicated there was unlikely to be any between-group difference." BJPsych Advances (2015), vol. 21, 396–404 doi: 10.1192/apt.bp.115.014563. "An attempt to commercialise the DBS SAC treatment approach has been made by St Jude Medical. The company commenced a multisite clinical trial which was expanded to 20 sites in 2011 and ended up recruiting at least 75 subjects. However, this clinical trial was halted in 2013 after a failed futility analysis (interim analysis of the data which suggested that it was unlikely that a trial would show clinical benefit"
is modest and may be consistent with a placebo response. Clearly, a larger prospective randomized trial with longer follow-up will be required to address the issue of long-term efficacy." Editorial, Deep brain stimulation and depression. "open-label studies such as ours are a preliminary step toward a controlled blinded study to attain an accurate appraisal of the safety and efficacy of DBS in patients with TRD. This is precisely what we hope to ascertain in the full-scale clinical trial we are currently undertaking." Sadly, despite their best efforts to identify the procedures, measurements, and variables essential to replicate their apparently effective treatment methods, the double-blind clinical trial sponsored by St. Jude was unable to demonstrate clinical benefit beyond that of the sham treatment. Hopefully the future will yield the understanding to enable a reliably effective treatment. Let us not forget that the lobotomy was originally praised for its efficacy. Similarly, let us not forget that some severely depressed patients looked to DBS when they had no alternative, and instead of effective treatment were stricken by significant adverse effects that left them in even worse condition. Hey neurocritic id love to get in touch with you since I'm having this surgery in Toronto. Could i get your email or something? Hi, if you leave another comment with your e-mail, I'll write back to you. I'll keep the comment private and won't publish your address. Thanks. So I was the patient in Toronto that just recently posted. Surgery went well and I'm currently free of any headaches or pain or any surgical side effects. I did have severe migraines for days after but I can understand given that it's a hectic operation. It has almost been a month now and I'm either ON or OFF. I won't know for 6 months. If anyone has any questions about the Toronto study please feel free to ask. I'm currently waiting on some reduction in my depression scores as i am still severely depressed. FILED BY ST. JUDE MEDICAL, INC.
SUBJECT COMPANY: ST. JUDE MEDICAL, INC.
the largest acquisition in Abbott’s history, and one of the largest in the medical device industry. intervention and transcatheter mitral repair. reduce costs for payors and deliver greater value to customers. Thanks for the tip! I found their press release, Abbott to Acquire St. Jude Medical. No mention of DBS. The Star Tribune has an article that mentions "Infinity deep-brain stimulator" but that is all. To the Toronto patient of April 20, 2016 -- I meant to thank you for the update. I sincerely hope that you experience some clinical improvement. I was one of the first patients in the Dallas study and implanted on DEC 2 ,2008. As soon as I had my first followup after surgery, it was the time whether or not they were going to turn me on. After hearing all the noises behind me, I felt a strong tingling start at the top of my head to the bottoms of my feet. I walked in feeling like crying and left with a smile. I attended my support group and told everyone I didnt know if I had it turned on or not. They all said that I had been because I was smiling for the first time since attending the group in 2005. It works for me. I dont have to have ECT treatments anymore. I am upset at the way I was dropped out of the study because they were not going to follow up. I was told when I started, that I was not going to be cast out and they would followup with me. I was lied to as to what would happen long term. "Oh they wont just drop you" I was told. The psychiatrist that I was using during the study up and went to another hospital. I'm left with no one who is familiar with the DBS and was told I would get a rechargeable battery which would require me to lay down for a couple of hours twice a week to recharge it. If I dont follow correctly St Jude would not help me out. I am glad it helped me but to get dropped with no future help is just not right. We should be still get follow up care and not dropped like a sack of potatoes and wash their hands of us. They did use MRI on me before and after implant. I'm very happy that your DBS treatment has help you. That's great. You mentioned the Dallas study? Can you be a little more specific? Is there a published article on that study? I was wondering whether you were asleep for the entire implant surgery? Or did they talk with you during the surgery? Do you know what your setting are? Also, where are your electrodes placed? Which part of the brain? You mentioned they gave you MRI scans both before and after implant surgery? That is interesting. How are you getting care at this point? Who handles the DBS device, programming, and battery replacement? Thanks for relating your experience. I'm happy that you no longer need ECT and are able to resume the fullness of your life before depression. I had hoped DBS would put depression into remission and I could resume working and living again. Sadly, the failed DBS left me even worse off. It is disturbing that even patients who benefit from DBS are left out in the cold. My spouse was implanted by Helen Mayberg's team at Emory in 2012 after nearly a half-century of treatment-resistant depression. Immediate remission, uninterrupted almost six years later with no side effects. Support before and after has been amazing.